But they sure smell like Swedish Meatballs! People seem to get really upset if you call something by a name that it isn’t. 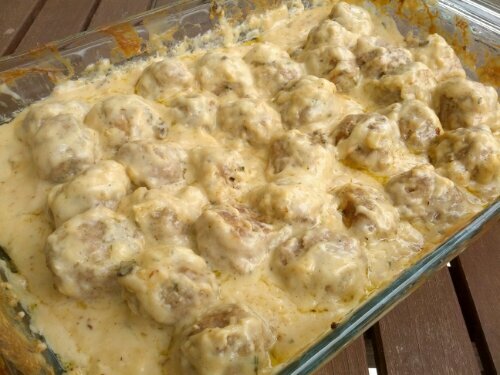 Like if I called these Swedish Meatballs, I would anger some individuals because they’re not authentic. For starters, I’m not Swedish so I don’t think I have it in my blood to make real Swedish Meatballs. I also can’t use beef when I cook because (for medical reasons) I can’t eat it. 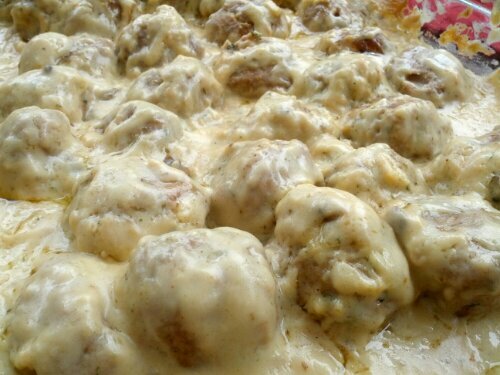 My faux Swedish Meatballs are made of just shy of 1 1/2 lbs of ground pork, 1 cup of breadcrumbs, 1 egg, a tablespoon of Worcestershire sauce, a teaspoon of salt, a teaspoon of pepper, a couple shakes of dried parsley flakes, a little evaporated milk & water (I didn’t have any real milk) (about 1/4 cup each), onion (diced) (1 cup) & garlic (1 teaspoon minced). I baked them for about 45 minutes (turning them every 10 or 15 minutes). Then I made a white sauce with 4 tablespoons of butter, 4 tablespoons of flour, salt, pepper, 3 cups of fake milk (1 1/2 cups evaporated milk & 1 1/2 cups water mixed in place of real milk) & then after that got just to boiling, I took it off the heat and added a can of cream of mushroom soup (mushroom just seemed like the right flavor to go along with the meatballs and I didn’t have any mushrooms). After the meatballs baked for the 45 minutes, I poured the sauce over them and let them cook for another 45 minutes (probably too long but I’m a freak about the fear of undercooking pork). We’re going to have them over egg noodles. They smell so good, I could care less if they’re not the real deal!